Have you been in a serious relationship for quite a while now and are ready to tie the knot? Are you ready to ask your significant other the most important question of your life? Well, get on one knee because this auction is about to solidify your future! This auction has one lot that consists of a diamond ring. This diamond ring is .71 ct, round brilliant cut, color G, and I1 clarity. A ring like this is something that she will wear forever, and you can be sure that she will be brought to tears when she sees it! Diamond rings can cost thousands of dollars, but now is your chance to purchase one at a reasonable price! If you would like to inspect this diamond ring in person before deciding whether or not to place a bid then you must contact the custodian ahead of time to schedule an appointment. This auction is located in San Francisco, California, and the closing time is on March 20 at 10:40 am central time. Right now, the starting bid is only $2,800 and there have not been any bidders so far. For any further information, simply click here to subscribe to www.governmentauctions.org for your FREE 3 day trial. Are you a jewelry lover who is always looking to add more shiny items to your fabulous jewelry box? Do you want to look stunning everywhere you go? Well, get ready to look your best because this auction will have you shining bright like a diamond! This auction has one lot that consists of a variety of jewelry. The jewelry in this lot includes 3 necklaces, 3 necklaces with pendants, 4 rings, 2 pairs of earrings, and 1 bracelet. If you are a man, this auction is perfect if you are shopping around for the best present for her birthday or your anniversary. We all know that jewelry can be quite expensive, but now is your chance at acquiring some fine pieces at a low price! If you would like to inspect this jewelry in person before deciding whether or not to place a bid then you must contact the auctioneer ahead of time to schedule an appointment. This auction is located in San Francisco, California and the closing time is on March 20 at 11:00 am central time. Right now, the current bid is $240 and there have been 3 bidders so far. For any further information, simply click here to subscribe to www.governmentauctions.org for your FREE 3 day trial. Are you in love with your jewelry and are always looking to add more stunning pieces to your set? Well, listen up because this auction is sparkling! 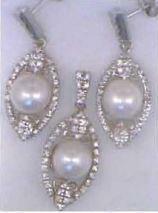 This auction has one lot that consists of 1 pair of pearl and cubic zirconium earrings featuring 2 round fresh water cultured pearls measuring 9mm, set in the center of a pair of marquis shaped sterling silver earring mounting surrounded by thirty four round faceted cubic zirconia measuring 1.5-2 mm each. There is 1 pearl and cubic zirconium pendant featuring 1 round freshwater cultured pearl measuring 9mm surrounded by thirty four round faceted cubic pendant mounting. This jewelry comes with certificate of appraisal. If you would like to inspect this stunning jewelry in person before deciding whether or not to place a bid then you must contact the custodian ahead of time to schedule an appointment. This auction is located in Chamblee, Gerogia, and the closing time is on January 29 at 5:43 pm central time. Right now the current bid is $10 and there has been 1 bidder so far, so make sure that you are the very next one and have a chance at winning this beautiful jewelry! For any further information, simply click here to subscribe to www.governmentauctions.org for your FREE 3 day trial. Are you in love with your jewelry and are always looking to add more stunning pieces to your set? Well, listen up because this auction is sparkling! This auction has one lot that consists of 1 pair of pearl and cubic zirconium earrings featuring 2 round fresh water cultured pearls measuring 9mm, set in the center of a pair of marquis shaped sterling silver earring mounting surrounded by thirty four round faceted cubic zirconia measuring 1.5-2 mm each. There is 1 pearl and cubic zirconium pendant featuring 1 round freshwater cultured pearl measuring 9mm surrounded by thirty four round faceted cubic pendant mounting. This jewelry comes with certificate of appraisal. If you would like to inspect this stunning jewelry in person before deciding whether or not to place a bid then you must contact the custodian ahead of time to schedule an appointment. This auction is located in Chamblee, Gerogia, and the closing time is on November 3 at 6:56 pm central time. Right now the current bid is $66 and there have been 4 bidders so far, so make sure that you are the very next one and have a chance at winning this beautiful jewelry! For any further information, simply click here to subscribe to www.governmentauctions.org for your FREE 3 day trial. Are you a woman who loves to wear jewelry and is always looking to add on to your already stunning collection? Do you want to wear the finest and most styling jewelry and be the center of attention? Well, listen up because this auction is an absolute gem! 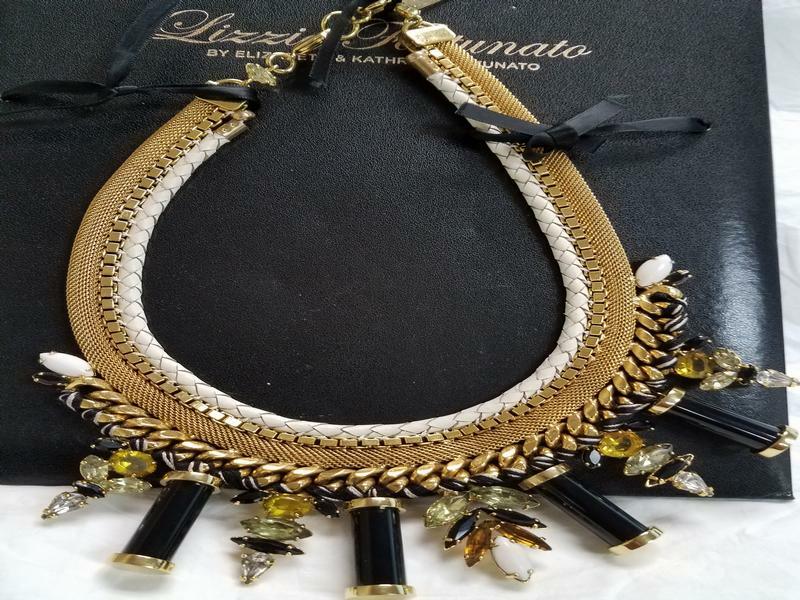 This auction has one lot that features a Lizzie Fortunato by Elizabeth & Kathryn Fortunato necklace. This necklace has a gold chain, and it has braided white leather with gold and black cylinder beads, with yellow, green, black, and white gemstones. This necklace will look fantastic with anything you wear, and it will look stylish at work, home, or at any event you attend! If you are a man, this necklace will make the perfect gift for your spouses birthday, anniversary, or Valentine’s Day. If you would like to inspect this necklace in person before deciding whether or not to place a bid then you must contact the custodian ahead of time to schedule an appointment. This auction is located in Springfield, Virginia, and the closing time is on October 19 at 5:02 pm central time. Right now, the current bid is $190 and, there have been 3 bidders so far. For any further information, simply click here to subscribe to www.governmentauctions.org for your FREE 3 day trial. Are you obsessed with jewelry and are always looking to purchase more? Well, get excited because now you can! 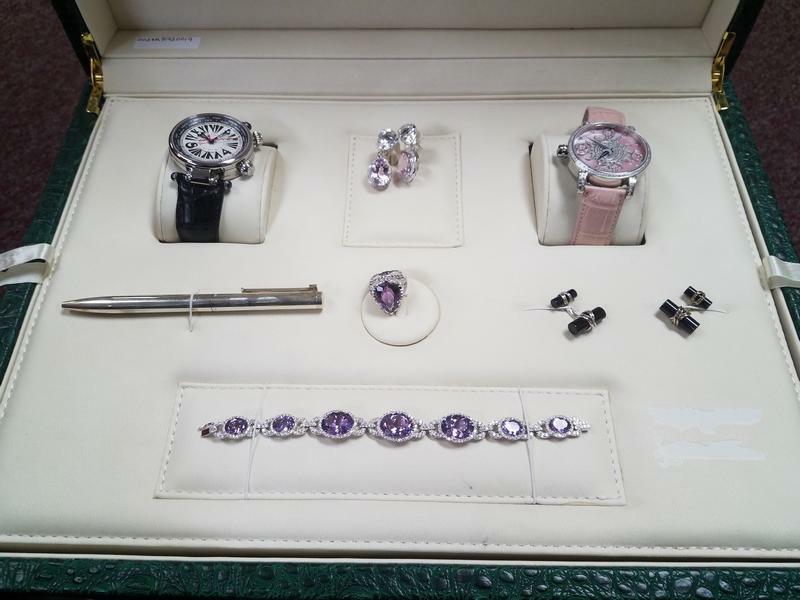 This auction has one lot of jewelry consisting of an 18 kt white gold ladies amethyst and diamond bracelet weighing 22.8 dwts, a pear shaped ladies amethyst and diamond and multi colored gemstone ring that is 18kt white gold and weights 9.1 dwts, a ladies amethyst and quartz clip with post earrings that are 18kt white gold and weigh 13.1 dwts with pinkish purple amethysts in the earrings, a Gio Monaco 373-A Geopolis automatic watch with white dial, a 554-A Eclisse quartz watch with pink band, a Tiffany T clip executive sterling silver ballpoint pen, and Tiffany & Co Sterling silber onyx bar cuff links. If you would like to inspect this amazing jewelry in person before deciding whether or not to place a bid then you must contact the auctioneer ahead of time to schedule an appointment. This auction is located in Springfield, Virginia, and the closing time is on October 10 at 5:03 pm central time. Right now, the current bid is $6,000 and there has been 1 bidder so far, so be sure to be the very next one! For any further information, simply click here to subscribe to www.governmentauctions.org for your FREE 3 day trial. This Is The Jewel Of All Auctions! An Amazing Jewelry Auction Just In Time For Valentine’s Day! Are You Ready Top Pop The Question?